A person gets diagnosed with diabetes when the body cannot properly use the energy it gets from the food we eat. Normally, the food we eat is broken down by digestion into glucose. This glucose travels through the bloodstream to give the body cells the energy it needs. Glucose needs the help of insulin, a hormone produced by pancreas, to get inside the cells, where this glucose is burned for energy. Diabetes is growing. The real cause of the increase in diabetes cases around the world is increase in body weight. But how does body weight lead to diabetes? This is because, when the body increases in size (gains weight) it becomes more resistant to insulin. This means, that you are no longer responding to insulin like a person with your body mass index should. This leads to you acquiring diabetes, as pancreas are limited to a certain level of inulin output, and now your pancreas have gone on an overdrive in order to overcome the obesity-caused resistance. Here is a list of tests that can help you detect the problem early. This test helps measure your average blood sugar level over the last 2-3 months. The reports help your doctor to understand how controlled your blood sugar level is and if it is in the normal blood sugar level range. The normal sugar level in blood or glucose level is the amount of glucose (sugar) present in the blood of humans. 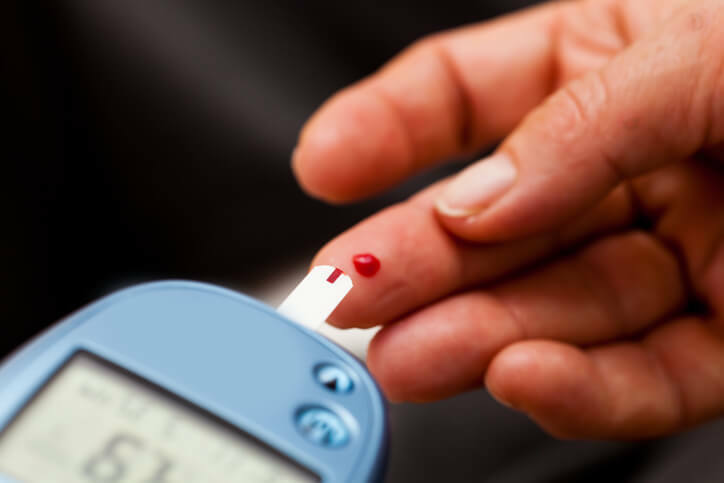 Normal blood sugar range: The normal sugar level for a person without diabetes, a fasting blood sugar level on awakening should be below 100 mg/dl. Before meals normal sugar range is 70-99 mg/dl. Sugar level in blood for a diabetic: For a person with diabetes, the ideal normal blood sugar range should be between 80–130 mg/dl before meal and after meals should be under 180. You can get a sugar test done twice a year. Keep a glucometer with you at all times. With a glucometer you can keep track of your sugar levels and be informed when your blood sugar is too high or too low. You can keep a record of your levels and cross check it with your doctor for a probable diabetes symptom. You are more likely to have high blood pressure when diabetic, which can increase your chances of having a stroke. It is advisable to have a blood pressure check every time you visit your doctor. Having diabetes, usually paves way for a heart disease. It is important to have a blood test taken annually to monitor your cholesterol. In this exam, your doctor examines your reflexes and checks your feet for possible calluses, infections or a sore. Incase an ulcer is detected, you should immediately consult a podiatrist. A lesser known symptom of diabetes is gum infection. When this becomes serious it can make it extremely difficult for you to control blood sugar level and lead to other health problems. Visit your dentist every 6 months, just to stay sure. Choosing the right food, and a check of your blood glucose levels can save you from a serious health issue.